Let's face it, at this point, there are very few people out there who haven't already seen a Spider-Man movie at some point in their lives. While this is typically something that would hold a retelling of a superhero's story down, it's actually something that Spider-Man: Into the Spider-Verse brilliantly uses to its advantage. Rather than putting Peter Parker at the dead center of the movie, as every previous Spider-Man movie has done, Into the Spider-Verse stars Miles Morales, a beloved character from the comics who fans have wanted to see on the big screen for years. Evidently, Miles is the perfect fit for the silver screen, bringing a new level of emotion to the Spider-Man franchise that we've never seen before. Unlike Peter, who has lost most of his family, Miles is a lot more family oriented, with his struggling relationship with his police officer father being one of the central motivations for Miles as the story progresses. Into the Spider-Verse is filled with fun moments as Miles encounters every other version of Spider-Man from the alternate dimensions. Characters like Spider-Man Noir and Spider-Ham end up stealing the spotlight for a good chunk of the movie, with their hilarious antics making every scene they are in heartily enjoyable. The different variations of the superhero we all know and love help to make the movie feel more fresh, as it plays off of the Spider-Man cliches we have become accustomed to in new and original ways. The movie even makes brief references to previous Spider-Man movies, which somehow manage to help make Into the Spider-Verse stand out even more. While the callbacks to previous Spider-Man movies help make this movie feel like a continuation, the essence of the story is still an emotional origin story. While the five Spider-Men from alternate dimensions are clearly established superheroes, the main hero of the story, Miles, has not yet reached that point in his career. This actually differs from the two previous Spider-Man origin movies. Both the 2002 Spider-Man and The Amazing Spider-Man featured Spider-Man becoming used to his powers within the first half of the movie so that he can be fully prepared to fight by the time the bad guy is revealed to him. Into the Spider-Verse, on the other hand, features Spider-Man struggling with his abilities throughout the entire movie, which not only raises the stakes, but really helps to make it feel like a "coming of age" story. Even with these brilliant narrative decisions, what really makes Spider-Man: Into the Spider-Verse standout as a fantastic movie is its unique animation style. The opening studio logos help to give a glimpse of what the movie will look like right off the bat, being unlike almost any other animated movie we have ever seen. Using cell-shaded animation styles, the characters of Into the Spider-Verse really pop on-screen, with their surroundings sometimes being on the edge of abstract, making it look almost like a comic-book that was brought to life. Another unique factor of the movie's animation is how the animation changes for the different characters. The perfect example is Peni Parker, the anime version of Spider-Man who, despite being in a non-anime dimension, still carries on her anime animation and movement as if she's still in her world. The same goes for Spider-Ham, who sometimes follows the physics of a cartoon, Looney-Toons-esque world, rather than the physics of a realistic world. Even Spider-Gwen's animation style differs from the rest of the cast, being almost identical to the abstract art style that has helped make her comic-books stand out on the shelf. 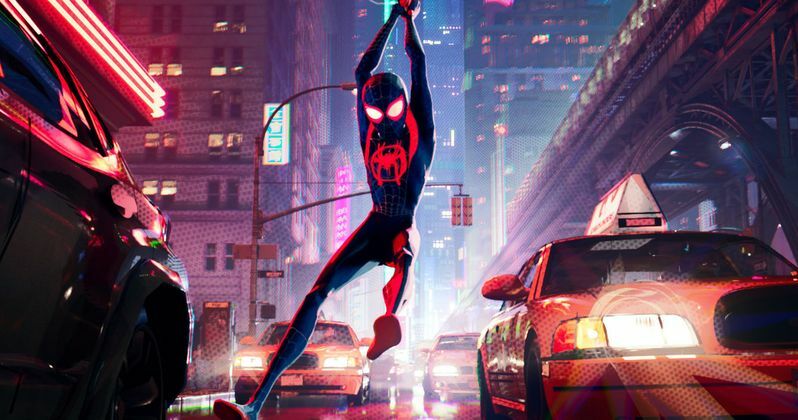 All in all, the unique animation and the brilliantly original narrative all make Spider-Man: Into the Spider-Verse a breath of fresh air in a movie market that is over-saturated with superhero origin stories. Hopefully Sony Pictures continues their plans to release more animated Spider-Verse movies in the future, as this could be the start of a truly entertaining and exciting franchise. Into the Spider-Verse may even be the first animated movie in years to truly give Disney a run for their for their money in the "Animated Feature" category at the 2019 Oscars.